A crowd gathers around the Seoul Sausage food truck Friday evening on Dickson Street in Fayetteville. Update: Sunday, May 27, 9 a.m.: Nonna’s Kitchenette and Coast of Atlanta will be at Botanical Garden of the Ozarks from 9 a.m. – 10 a.m. this morning. Pop-A-Waffe and Seoul Sausage were spotted on Dickson near the post office. 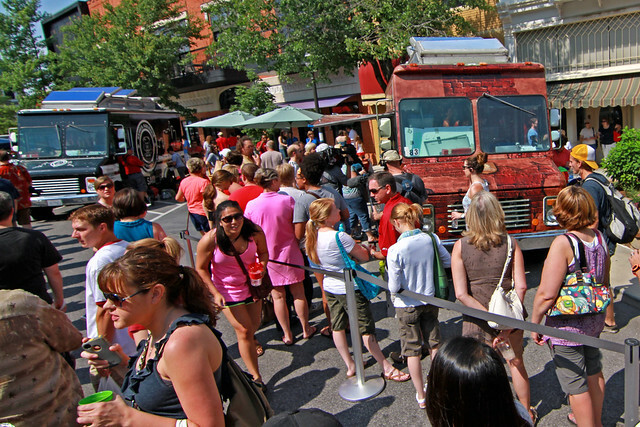 Update: Saturday, May 26, 12:00 p.m. : The trucks were shut down on the square just before noon. 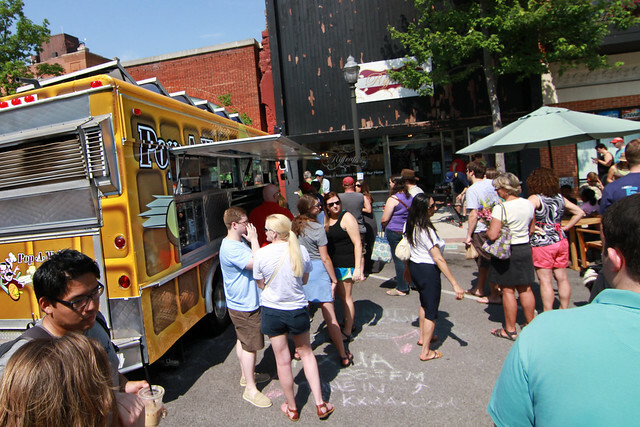 They’ll be back on Dickson Street Saturday late night at 1 a.m.
Update: Saturday, May 26, 8:30 p.m.: We’re heading down to the Farmers’ Market to check out the trucks. We’ve heard all five are there this morning. Update: Friday, May 25, 3:00 p.m.: We just heard that Nonna’s Kitchenette will be selling food on Dickson Street Friday night. 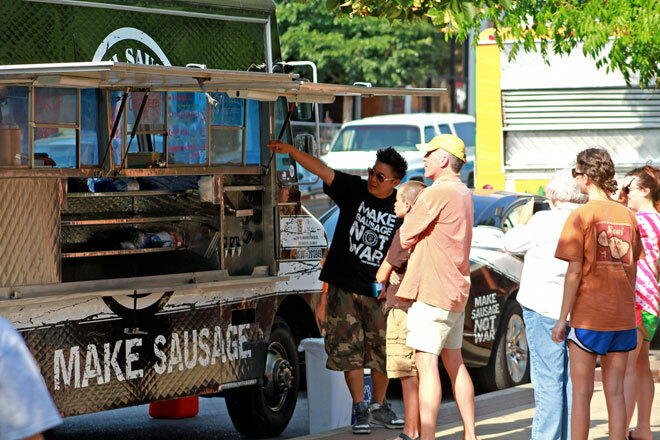 Update: Friday, May 25, 12:45 p.m.: We just heard that Seoul Sausage will be set up at Walton Arts Center on Saturday. Also, Nonna’s Kitchenette will be at the Farmers’ Market on Saturday until 2 p.m., Dickson Street Saturday night, and at Walton Arts Center on Sunday. 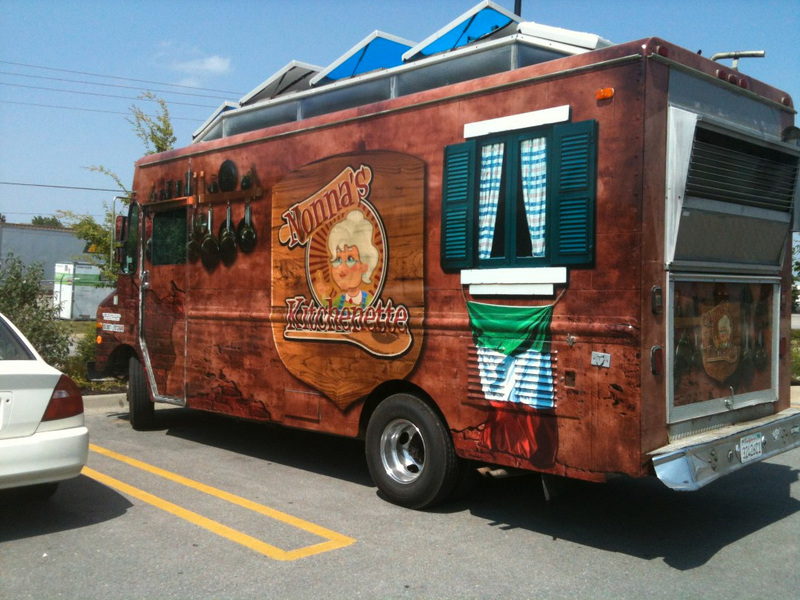 Nonna’s is considering setting up at the Botanical Garden’s Sunday. 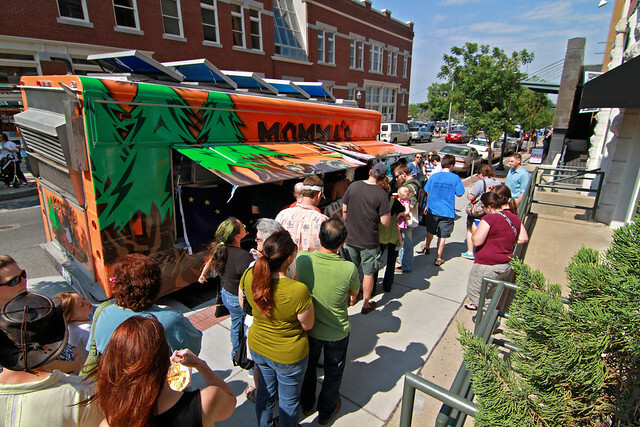 Surely by now you’ve heard that Food Network’s The Great Food Truck Race will be filming an episode in Fayetteville this weekend. And while we have our suspicions, there’s been no announcement (nor do we expect one) about where exactly the five remaining food trucks will be set up to sell their food around town. We’ve heard that at least one truck will be set up on the Block Avenue side of the downtown square during or after the Fayetteville Farmers’ Market on Saturday. 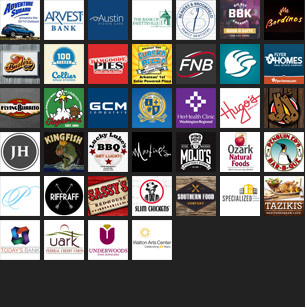 We’ve also heard that Ozark Natural Foods, Little Bread Co., and Maudie’s Seafood Market are on the list of locations where the contestants might be purchasing food for the weekend. 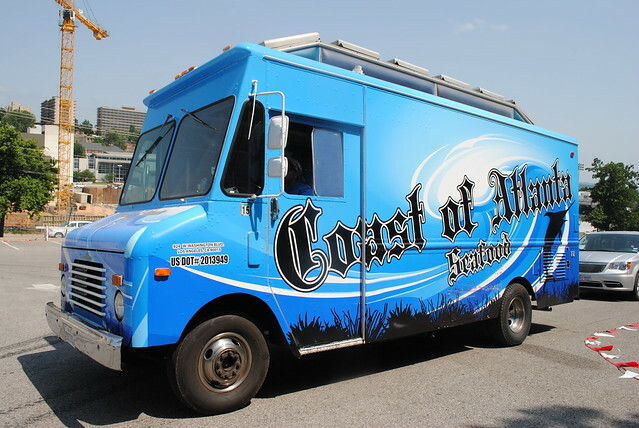 The purpose of this post is to pull in tweets tagged with #GreatFoodTruckRace and #GFTR in order to keep up with the trucks as you guys spot them around town. We’ll also add more information as the weekend unfolds. Also, feel free to leave a comment below with any information you hear. The six trucks that were in Amarillo for last week’s filming are listed below. At least one was likely eliminated, but this will at least give you an idea of what to look for this weekend. Coast of Atlanta from Atlanta, Ga.
Pop-A-Waffle from Los Angeles, Calif.
Seoul Sausage from Los Angeles, Calif.
Nonna’s Kitchenette from Parsippany, N.J.
Coast of Atlanta, spotted on the UA campus Friday afternoon. 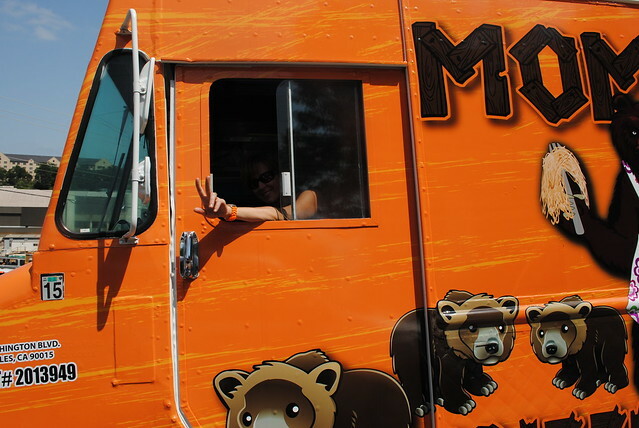 Momma’s Grizzly Grub, spotted on the UA campus Friday afternoon. 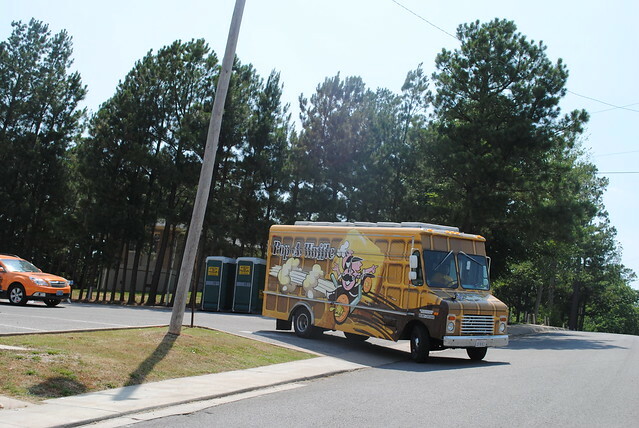 Pop-A-Waffle, spotted on the UA campus Friday afternoon. 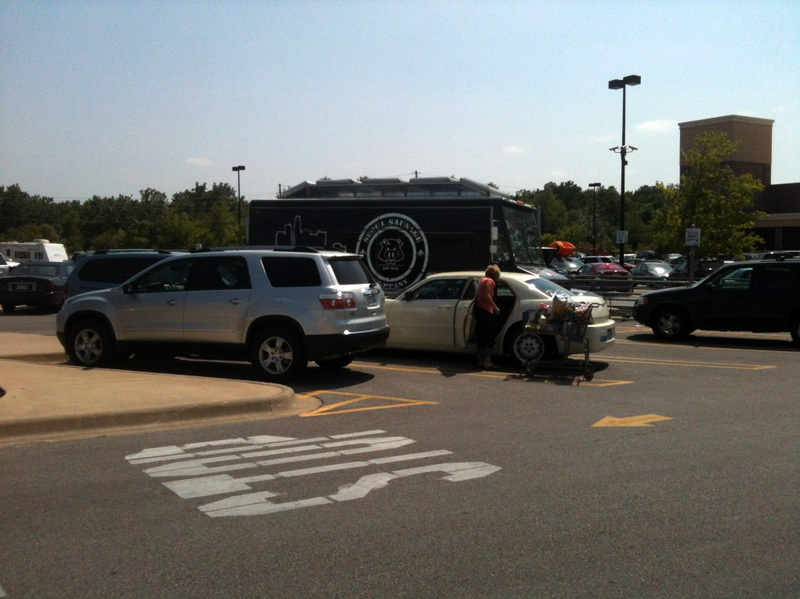 Nonna’s Kitchenette, spotted at Sam’s Club Friday afternoon. Seoul Sausage, spotted at Sam’s Club Friday afternoon.